The power of nature is everywhere. Last week, before my wife and I wrapped up a brief but fantastic beach trip, we saw that power on display. While dining at a great restaurant overlooking the shore, Tidal Raves, we noticed people walking out on a rocky point. 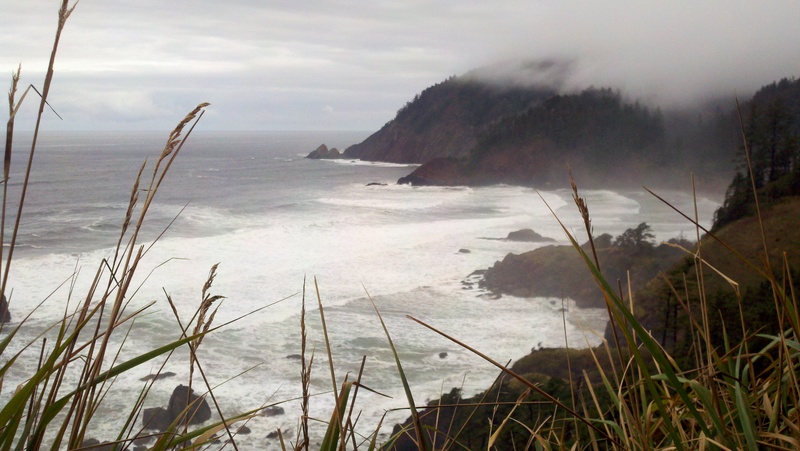 Occasional massive waves crashed onto the point, and the hikers disappeared. We both thought the hikers may have been a bit short of brain cells. 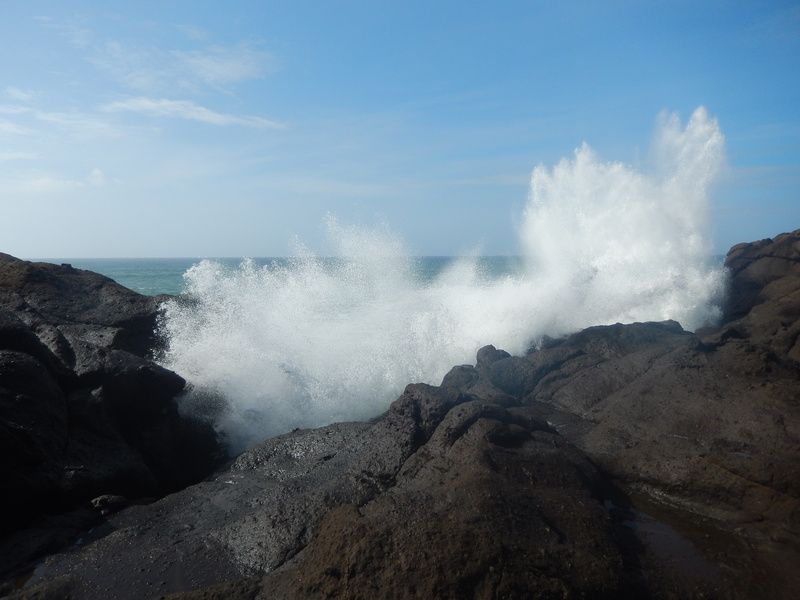 It looked like an amazing spot, enhanced by the potential danger of big waves. So of course I wanted to go out there too. After finishing our tasty meal, we found an nearby access trail, and we wandered along the shore. Denise was still recovering from a heel injury, so it was tough for her to attempt such a walk on uneven ground. Ultimately, she stayed on a grassy shelf above while I clambered out on the rocks, feeling at home. As I headed to the end of the point, the surface became very irregular. It seemed to be some kind of volcanic rock. I definitely had to watch my step. I skirted a steep drop off and crossed a gap in the rock where wave surges came through, then clambered onto high ground to wave gawk. In moments, I was mesmerized. Such power, such beauty. Even as I wanted to move about, I could not turn my back on the waves. Not every wave was spectacular, but there was a large one on a regular basis. 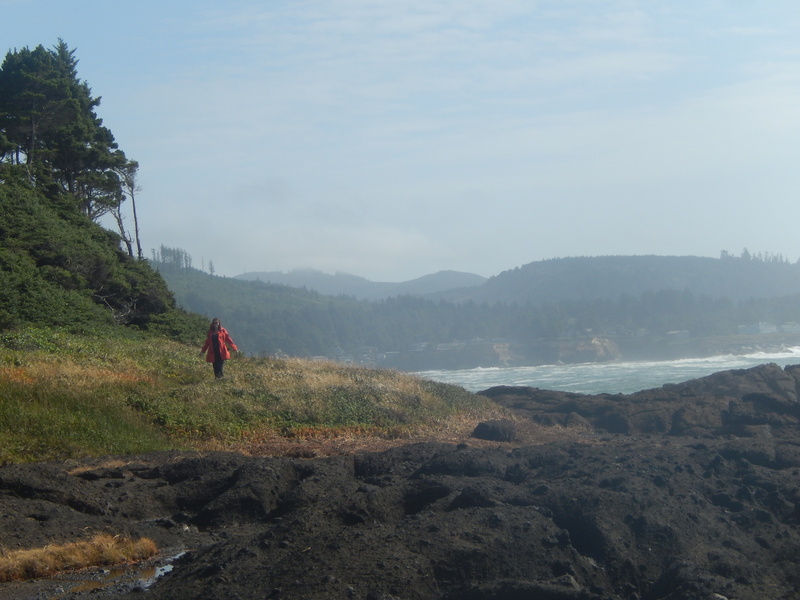 A human being on the rocks seemed inconsequential. Other people were also watching the ocean further up the cliffs that resembled a bluff, and I sauntered that way after leaving the point. Denise and I looked for whales but did not see any. As we walked back to our car, a man and woman said they had seen multiple humpbacks slightly to the north. It was good day on the Oregon coast. My wife and I were very lucky to get what was basically a free trip to the beach. The weather finally turned, so we hoped the rain would help firefighters with the many fires in the American West. 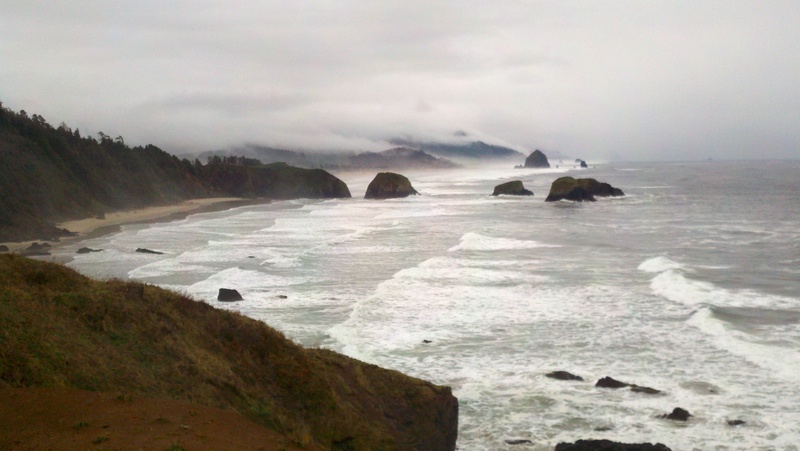 Alas, the precipitation was relatively modest, but that meant our beach trip was more pleasant than expected. After romantic walks on the beach in Newport, we visited Yaquina Head. While Denise stayed in the visitor center, I strolled up Salal Hill and checked out Cobble Beach below. Great spots. I think we visited the area more than a decade ago. This was a great rediscovery, and well worth the time. I could say that our quick trip to the beach went without a hitch. I could say that the weather was perfect. I could say that my wife was thrilled about hiking today at Ecola State Park. I could say that our dog again amazed me with his training. Sadly, those would all be lies. It was misty when we arrived at our hotel. A walk on the beach quickly got interesting. We took the wrong path and ended up in a broad grassy area in front of condos. Not a soul was around. We thought it was a good place to let Jackie Chan off leash. Wrong. I threw the ball once, and he ran hard—the wrong way, immediately veering to the south. I called to him, but he kept going. I noticed manure on the ground that looked a bit like horse droppings. 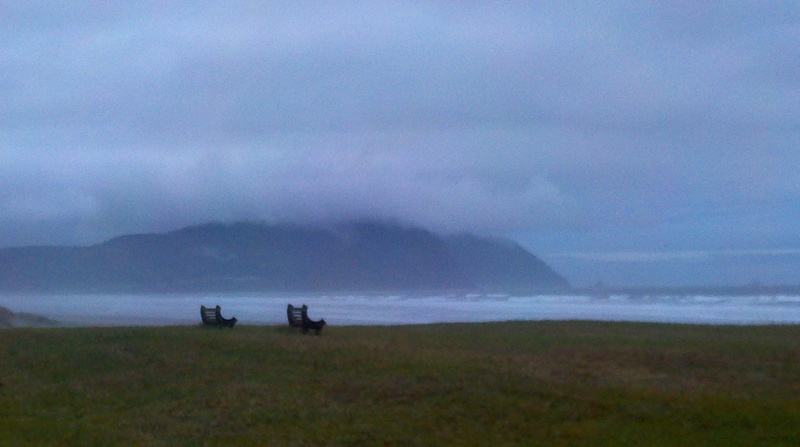 It turned out there was a herd of elk on the Oregon coast. I could see a few heads beyond some dune grass. Jackie returned in a few minutes. The leash stayed on after that, as we walked in the rain on the sand. We had a nice evening in the McMenamin’s Gearhart Hotel, enjoying happy hour and a movie, then relaxation in our room. In the morning, we went out for a second walk on the beach. Neither rain nor elk interfered this time. We had a great breakfast at the hotel, then packed up and headed to Ecola State Park. As Denise was still recovering from a medical procedure, she wasn’t up for much hiking. We did manage to stretch our legs a bit, then we headed home, feeling lucky that the beautiful Oregon coast is close enough for short trips..